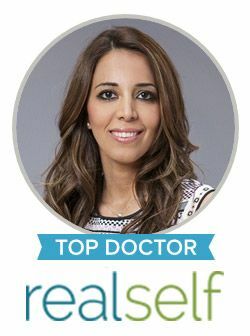 If you want to correct the sagging or loose skin around your jawline and upper neck but don’t want to undergo a traditional facelift surgery, you may want to consider an awake facelift from Dr. Sanaz Harirchian in Houston. Dr. Harirchian is exceptionally qualified to perform a variety of face & neck procedures, including the popular awake facelift, also known as a painless mini facelift. This innovative and less invasive approach specifically targets and improves sagging jowls and jaw lines using tiny incisions and only local anesthesia. Dr. Harirchian is able to perform this quick lower facelift technique by using local nerve blocks and gentle infiltration to numb the face. Just as the name implies, patients can remain “awake” during this procedure and still achieve remarkable results without procedure discomfort. With her advanced surgical skill set and a deep plane facelift approach, Dr. Harirchian is able to lift the underlying tissues of the face to create long-term results that appear natural and functional. Patients may choose to listen to music, chat with the surgical team or nap during an awake facelift procedure. Great Results and Minimal Downtime! Choosing a facelift procedure without the use of general anesthesia delivers a number of valuable benefits for patients. A primary gain is that this approach represents a safe and attractive option for those who are afraid to receive anesthesia or are unable to due to health reasons. However, patients also benefit from a significantly shorter recovery and less downtime when local anesthesia and minimally invasive techniques are used. In addition, not receiving general anesthesia typically means less bruising, less swelling and less expense, which are greatly appreciated advantages for patients choosing the awake facelift. Do you want a long-term solution for your sagging jaw and neck but can’t afford the downtime of traditional plastic surgery? Contact Dr. Sanaz Harirchian today to learn if you are a candidate for an Awake and Less Invasive Mini Facelift in Houston.